At Roche’s Pedigree German Shepherds, we understand what it takes to produce high quality puppies loaded with the expected color, structure, and temperament seen in the most coveted German Shepherd bloodlines. That’s why we’re so excited to share our standing at stud German Shepherd Max Von Den Warsteiner Quellen. 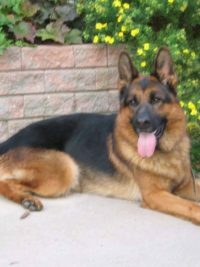 As your premier German Shepherd breeders in Southern Wisconsin and Southern Minnesota, we believe that Max leads the pack when it comes to German Shepherd stud services. 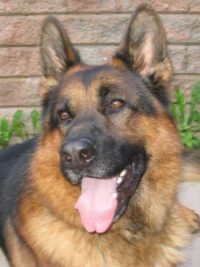 Max Von Den Warsteiner Quellen is a Schutz 1 whose grandparents are 2X VA 1 Remo Von Fitchtenschlag and 2X VA 1 Gina Vom Aquuamarin. He is also IPO 1 and has been producing top of the line litters since his arrival in Wisconsin. Max not only offers this excellent pedigree, he possesses a wonderful disposition, tenacious drive, and a stable mind. 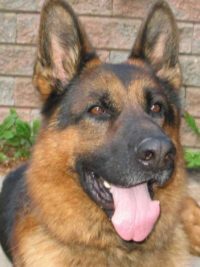 He is truly a German Shepherd breeder’s dream and will not disappoint. When you’re searching for German Shepherd breeders in Southern Wisconsin and Southern Minnesota, we want you to be confident in your selection. That’s why we only bring in the best dogs to stand at stud here at Roche’s, and we’re sure you’ll agree when you see the results. Your litter will be phenomenal and will wow you in every way. We also take great pride in the care and upkeep of our animals and routinely check Max for sperm quality and motility. He regularly provides excellent results and we expect to see similar outcomes as we maintain his health and vigor. Max is an opportunity you do not want to miss out on. We are incredibly excited to announce his availability to you as a German Shepherd stud dog, and guarantee your satisfaction in our services as your German Shepherd breeders here in Southern Wisconsin and Southern Minnesota. Contact Roche’s today for more information about our stud dog, Max!